The process of procuring accurate information on the location, financial situation, and key details of a debtor can be like stumbling around in the dark. The good news is that WhenFresh’s unique data sets can shine a light on it for you. Through the use of up-to-date and verified information, including the UK’s largest home-mover database – Land Registry data – we can integrate seamlessly with your existing practices and assist you in three core areas. This will save you time and money, as well as helping to provide the best possible outcome for your customer. 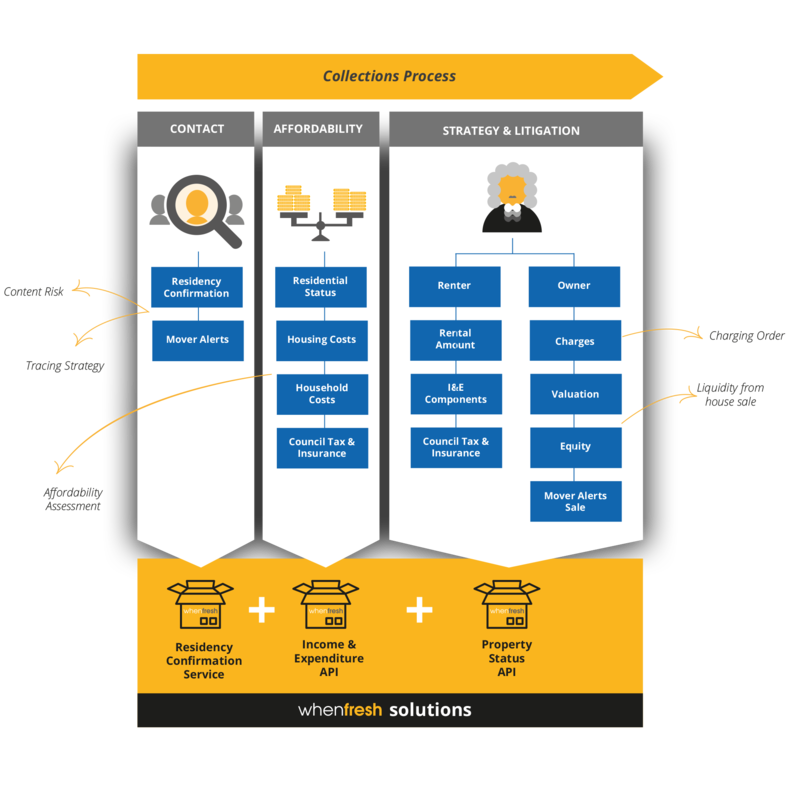 Throughout the collections process, we offer three solutions designed to enhance, complement, and seamlessly integrate with your existing methods and systems. Collections professionals are able to use as much or as little as you want of our offering. From our initial-stage residency and confirmation service, using bang-up-to-date home-move data, to our comprehensive API plugins for income, expenditure and property status, designed to assist you in providing satisfactory solutions and outcomes for all parties. Knowing which debts are more likely to be settled, and therefore which accounts you should focus on first, allows for a much more efficient way of processing collections. Collector A ranks a book from most to least likely to be contactable, giving you a good idea of where you should expend your effort first. The data fed into the model is driven by proprietary data sets linked to the rapidity of turnover of occupancy at an address and the last observed change of occupant. If the debt has moved on then you will need to change your effort on collection. The lowest hanging fruit is still attached to the tree. Collector A establishes which apples are still on the branch and which fruit you will need to look harder to find. The first step in collecting is knowing that a debt can in fact be collected. The book’s Contactor score will tell you what’s likely to be collected and what is going to be a lot harder to chase. Treating Customers Fairly (TCF), requires firms to be able to demonstrate that they are delivering fair outcomes to consumers. Obtaining accurate financial information from people in difficult debt-related situations can be a challenge. This is where we can help. We process millions of records at a household level. This allows us to calculate council bill payments, heating costs, water charges and insurances. We also determine accurate rental and mortgage payments which are usually the most significant expenditure and are vital to a fair payment arrangement. By embedding our data into your Income and Expenditure systems and processes, we can assist you in forming a much more accurate assessment, more quickly and easily, allowing customers to make repayments comfortably and on-time. Click here for more details of the WhenFresh Income & Expenditure piece. When legal proceedings become the only route left to take in recovering a debt, if the customer/debtor is a sole or joint owner of a property an application can be made to the courts for a Charging Order. We can offer a much more robust solution with deciding litigation strategy and execution through the use of our property movers and valuation. To find out more about WhenFresh Collections Suite, please call Paul Rout on 020 7993 5818 or complete the short online enquiry form.